you, reading the graffiti above your hair. despite my dizziness, despite your practical nature. Where was Scott? Who put the locks on the windows? seemed like it could stretch all the way home to Alabama. Whilst the poem captures a sense of disassociation, a person clinging to dreams because reality is too harsh, it doesn’t offer any new insights or touch on Zelda’s complicated feelings towards Scott, a man who’d shown promise but sunk into alcoholism. By 1936, Zelda’s own novel had been published to a disappointing reaction and her attempts to revive her career as a dancer had met with patchy success. The poem pointedly references “a waltz” and “Alabama” but there doesn’t seem to have been enough research to raise it above reportage. Here is another woman waiting for her husband. 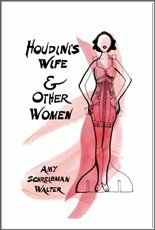 Amy Schreibman Walter’s poems focus on longing, usually for love, and the blurring of dreams and reality. Her women, however, are not contemporary; they passively wait for their princes or settle for approximations of love rather than actively seeking out a man who can satisfy them. In places, particularly in “Asheville, 1936”, it also feels as if the poems have settled into comfortable rhythms and vocabulary instead of being pushed to rise beyond a professional competence. Emma Lee‘s most recent publication is Ghosts in the Desert (IDP, 2015) and she was co-editor for Over Land Over Sea: poems for those seeking refuge (Five Leaves, 2015). She blogs at http://emmalee1.wordpress.com.